I don’t know how I missed her but I did. Hurrying home from a writing workshop on the other side of the town, there were only two things that occupied my mind at that hour – a satisfying lunch and an even more satisfying nap. Eyes peeled on the road for shady spots and corners to walk by in the blazing afternoon sun, I passed her like a galloping horse with blinkers, till a gang of kids hailing MOLLY’s name in chorus, brushed past me. 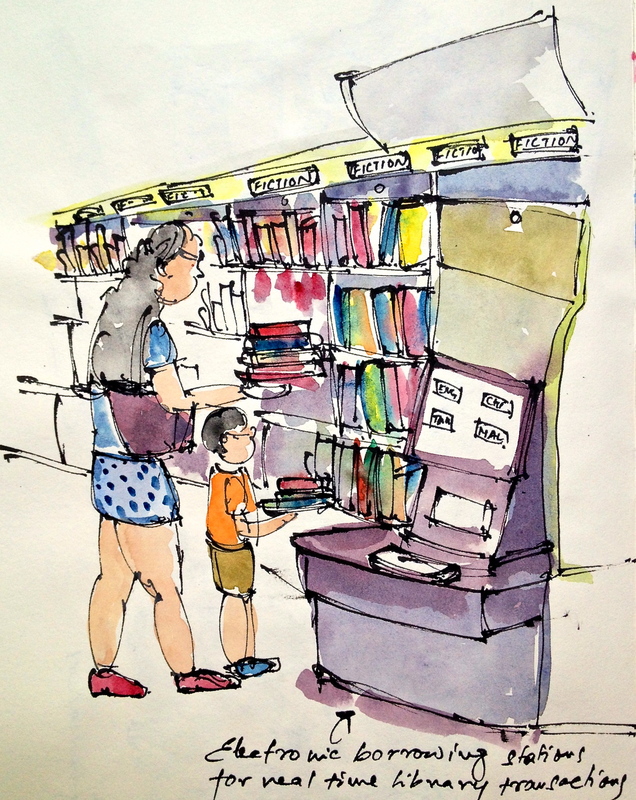 Turning around, I looked straight into the big fluttering eyes of MOLLY, Singapore’s only mobile library. 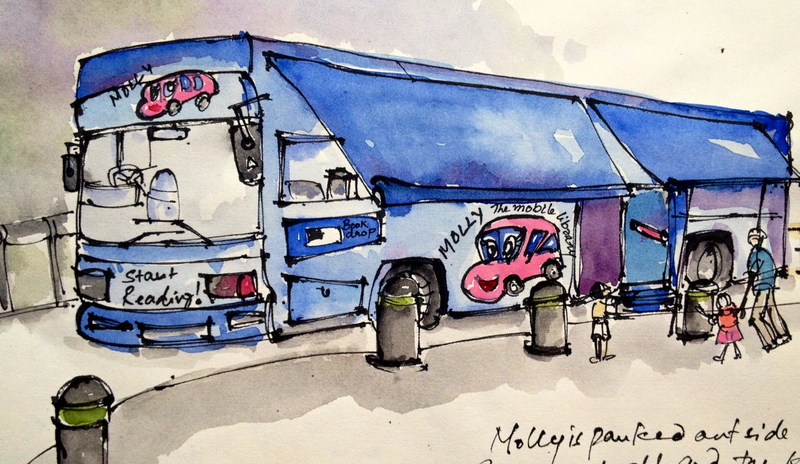 A refurbished public transport bus with imposing body stats – 11 meters in length, 2.2 meters in width, 2.1 meters in height and 16 tonnes in weight, MOLLY makes quite a statement on the road. Sporting an attractive decal of vibrant blue with animated characters, tiny trees and fluffy clouds drawn across her body, Molly’s visitor profile isn’t worth a guess either. Parked along the kerb, in front of our neighbourhood mall, the bus’s door is wide open and the retractable awnings are drawn. Molly is open for business and the little ones are pouring in. Some are even returning books at the nifty ‘book-drop’ unit fitted below the bus’s window. Sandwiched between the eager little readers, I squeeze myself through the door. Housed in a bus it may be, but it’s a library all right. Neat shelves on either side hold about 3000 books, that are grouped by age and labelled as per genre. An electronic book borrowing unit is stationed at the rear end of the bus, where a uniformed library assistant is familiarizing children with the borrowing process and encouraging the curious first timers on board to register themselves as library members. I am the last person in the queue, and with the same tenderness that she was showing the children, this 50 plus years old library assistant Norida Abdullahab, helps me not only borrow the books but renew them as well. ‘So you can use these for an extended period.’ she says, flashing a reassuring smile. Though the passage inbetween the shelves is narrow, the interior is well furnished. Good lighting and air-conditioning make for comfortable browsing and reading . Needless to say, the kids are having a ball. Some are sitting on their haunches, pulling out one book after another and sifting through them, while others are slouched on the floor, reading meditatively. The shorter ones are begging their mums and dads to be picked up, so they can reach a higher shelf. “How about Emperor’s new clothes?”, suggests a mother. Or “City mouse and country mouse? That sounds interesting!”, coaxes another, whose girls are sitting around a pile of fairytales. It’s harder than it looks to convince their little minds. Norida is picking up the books from the floor and putting them back on the shelves. 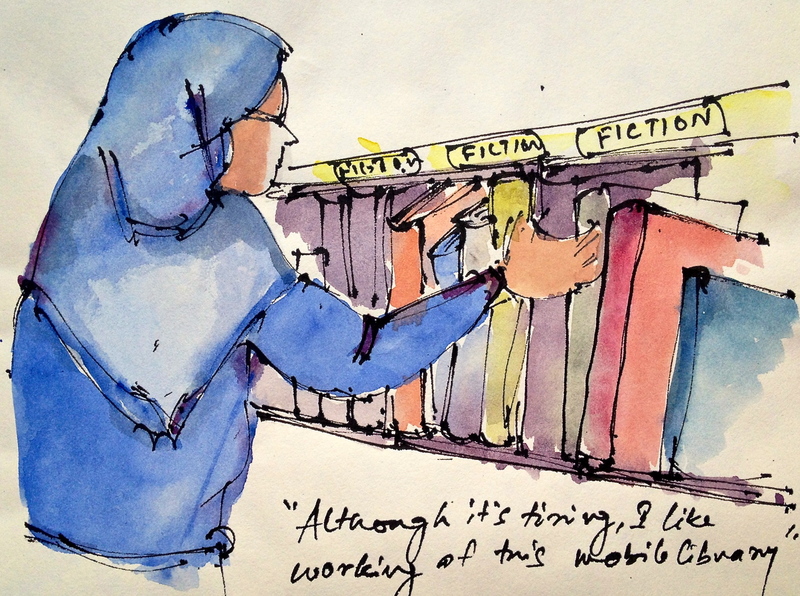 “Although tiring, I like working at this mobile library.’ she says. MOLLY has been her workplace for the last seven months. “I have worked at the National Library for 16 years and only recently did I request for a transfer” she adds. The mobile library has two teams with 3 members each – two library assistants and a group leader – visiting various locations on the island. Norida points out the printed schedules on the wall, with names of 8 locations each, to be covered on the following Saturdays and Sundays. I learn from her that, MOLLY is a 5 year old endeavour of the National Library Board of Singapore to make library services more inclusive and accessible to all, especially the undeserved community, so they too can discover the joys of reading. Looking at the gleeful children lined at the borrowing station balancing piles of books, waiting for their turn, I feel comforted and happy thinking whether privileged or otherwise, this outreach activity of simply promoting the use of a public library at this tender age, so they become active users in the long run and use public libraries as a part of their lifelong learning journey, bears more value today than ever, specially in the context of kids growing up in a digital age with no dearth of multimedia at their disposal. 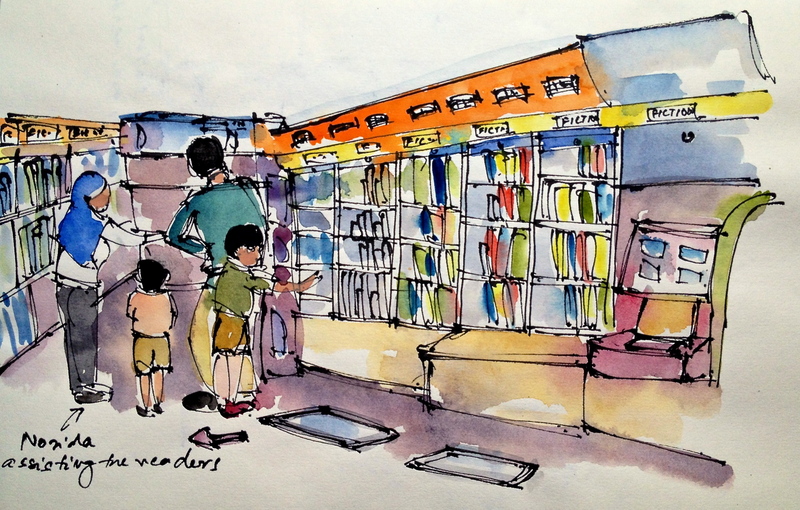 A mother asks Norida to help her locate books for children at level 3. “Boy or a girl?” she asks, springing right into action. ‘Girl’. “Well, then she might like these.”, says the library assistant, handing her few carefully selected options. Norida not only has sound knowledge of the library’s collection but she also provides customised recommendation to every reader requesting her assistance. Turning back to me, she says, “I love my job at the library, but I always wanted to go out and make a difference, instead of being stationed at one place.” Reaching books to those with limited or no access to a library on a mobile bus, has fulfilled both her wishes. This is the reason she voluntarily requested for a transfer, after a decade and a half of service at a public library. 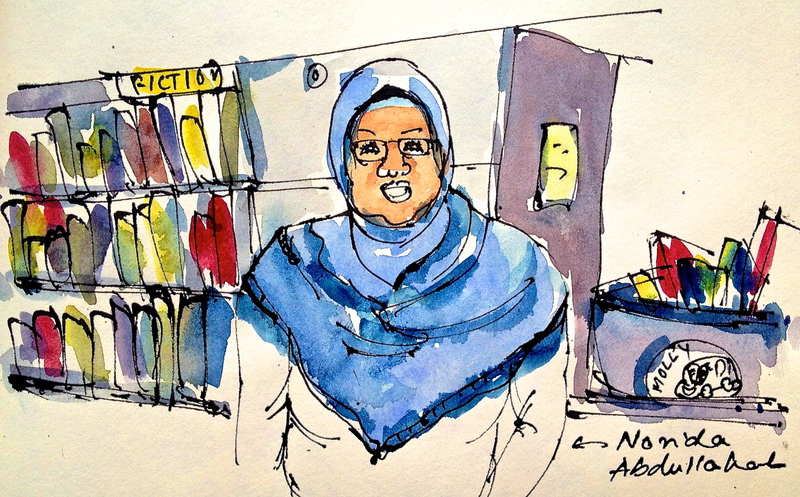 This entry was posted in Daily Vignettes and tagged drawing, Library, MOLLY, National Library Board, Public library, Singapore, sketching on June 14, 2013 by Somali Roy.